Expert medical care when you need it! Do you have a chronic cough, chronic sinus congestion, chronic sore throat? These may all be indicators of allergies. If you are constantly going to the ER or urgent care center maybe its time to ask why you haven't been tested yet. Most people cannot just walk away from opioid addiction. They need help to change their thinking, behavior, and environment. Unfortunately, "quitting cold turkey" has a poor success rate - fewer than 25% of patients are able to stay clear for a full year. Medications - One size does not fit all. More than 75% of people have genetic variations that determine how their bodies process and use drugs. This applies to prescription medications, over-the-counter medicines, herbal and dietary supplements. Emergency rooms are not the fastest or most cost effective choice when you need immediate health care, and you could wait hours in the E.R. for less serious health concerns. That's too much time and money lost. That's why Elite Urgent Care is the ideal alternative for your health care needs. Elite Urgent Care is owned, operated, and staffed by emergency room physicians with years of experience in emergency medicine. With the changes in our healthcare environment, primary care doctors are backlogged for weeks and sometimes even months; Elite Urgent Care offers a more convenient and less expensive treatment option for non-life threatening medical conditions that cannot wait for a scheduled appointment. 1) Patients who need to be seen immediately, but can't be seen by their regular doctor because of scheduling, after hours, holiday, etc. 2) Patients who don't want to wait in the emergency room for hours and then have a huge bill. 3) Patients who don't have a regular physician or who are visiting from out of town and need medical care now. We know you're excited about your trip, but also concerned about your health while away from home. Getting sick while traveling away from home can be a horrible, terrifying, and expensive experience. So let us prepare you for your trip. 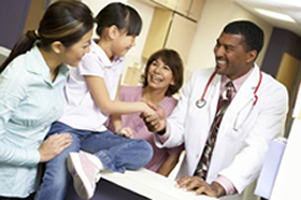 School and sports physicals consist of a medical history and a physical exam. The goals of these physical examinations are to evaluate a child's or student's general health, current fitness level, risk of injury, and physical well-being. Copyright Elite Urgent Care Centers ©2014. All rights reserved.